This recipe could be called "what to do with a bag of nearly overripe peaches." I had purchased a bag of eight, and within a couple of days they'd turned squishy under their velvet skins. Slicing them into manageable chunks was impossible because the flesh was so soft. It simply fell away from the pits. Ironically, it is at this not-yet-spoiled stage that their fragrance and flavor is sweetest. After much consideration and conversation, we settled on making quick jam. Turns out, this was the best possible idea. What I found was a new favorite filling for cakes, tarts, macarons - you name it! 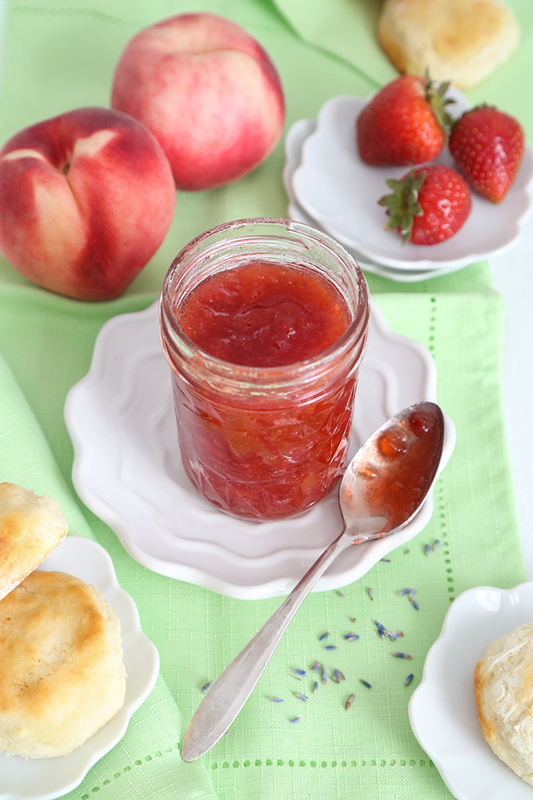 The jam gets just enough steeped lavender to punctuate the fruit flavors. It's such a mild floral note but it really makes a big difference in the finished jam. The mixture gets its ruby red appearance from just a handful of strawberries - we used four in this recipe. Even if you don't have overripe peaches, this recipe is worth a try. I especially recommend it if you're looking for an interesting cake filling with big summer flavor (I have plans!). Around here, it's earned the name "summer in a jar." I can tell you with much conviction, it's really great on my grandmother's buttermilk biscuits. You can find the biscuit recipe here. Place the lavender buds in a small cup. Pour the boiling water over the buds and let stand 10 minutes to steep. 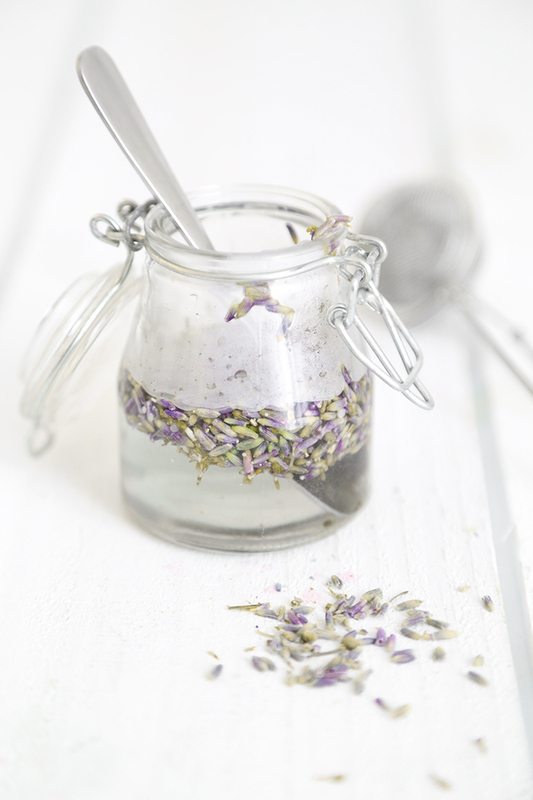 Strain the lavender water into a bowl and set aside. Discard the buds. In a large nonstick pot (at least 3 quart) combine the peaches, strawberries, sugar, and lemon juice. Bring to a boil and cook while stirring often; cook until thick and syrupy, about 15 minutes. Add the lavender water and stir. Return the mixture to a boil and cook stirring often until the mixture reaches desired thickness. Cooking time can range from 2 minutes to 15 minutes. Cook 2 minutes for syrupy jam, cook longer for thicker jam. We like our jam thick, so we cooked it for another 15 minutes. Remove jam from the heat and let cool to room temperature. Transfer to jars and chill, covered at least 2 hours before using. This jam keeps in the refrigerator for up to one month. Inspired by a recipe in The Sunset Cookbook (Oxmoor House). Beautiful and perfect summer flavors! Definitely trying this weekend! 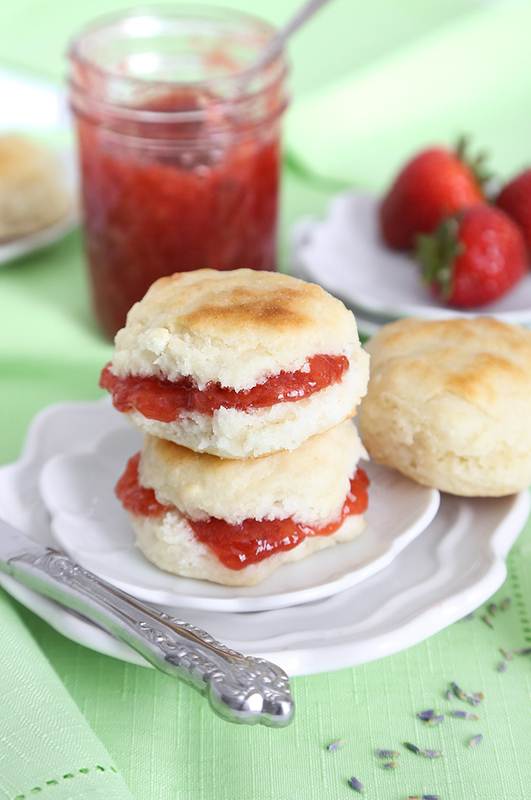 This jam looks so delicious and perfect for brunch! It looks like summer in a jar...must make some so I can taste the sunshine. One pound of peaches, two, gave me one and one half cups. Can’t wait to see what cakes you make with this! Can this be canned/processed in a water bath for longer storage?